I designed and delivered an online English course, web2english, in 2009/2010. This online course contained two types of environments: a personal teaching environment (PTE) and personal learning environments (PLEs) [see figures 1 and 2 below]. The same tools were used in both; however, students’ use of these tools for content creation was more limited than that of the teacher. 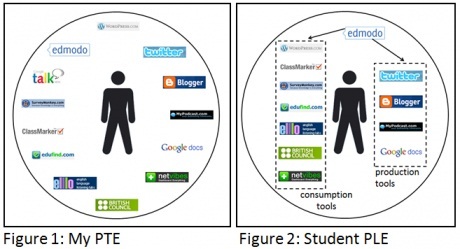 Taken in isolation, both the PTE and the PLEs were mechanisms, “tools, artefacts, processes and physical connections” (Couros, 2010, pg 125) for controlling and managing online teaching/learning. But they were not used in isolation; they were part of a wider network in which people and content were connecting together (Downes, 2010), and it was these connections that enhanced the learning process. 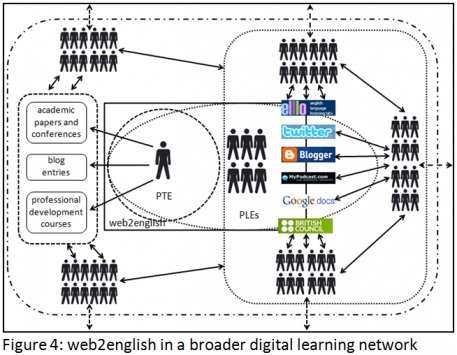 Figures 3 and 4 below show how the PTE and PLEs are located within a larger digital learning network (DLN). Figure 3 depicts the learning connections that existed during the 12-week duration of the course. A large number of connections were created, but these were almost exclusively between the teacher and students and between students and students. The content production tools, twitter, blogger, MyPodcast.com and Google docs, did produce some connections with non-course members. Similarly, the WordPress portal also generated some additional connections. Students were also able to make connections with non-course members when using the British Council and elllo.org learning resources; however, the connections consisted of reading non-course member comments, rather than personally contributing to these external learning communities. I feel that the short duration of the web2english course and the lack of follow-up learning opportunities for the students resulted in fewer external learning connections being made. Had the students continued using the content creation tools as part of a longer learning process, the possibility of creating additional connections with other teachers, students and non-course members would have increased. 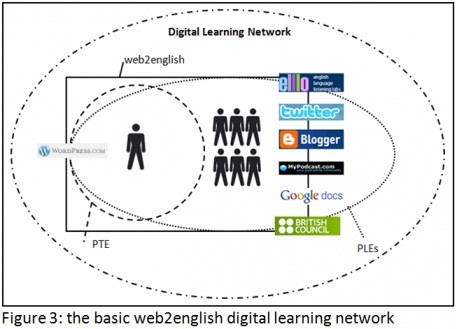 Figure 4 above shows how a DLN, with web2english at the centre, may expand over time. Already, my experience delivering the course has led to connections being made with fellow educators though academic papers and conferences, entries to this blog and professional development courses that I have run. Some of these educators have in turn looked at the work produced by the students. Ideally, students would also continue using their content creation tools and learning resources to establish more learning connections. Please have a look at the resources below, in particular Stephen Downes lecture. Think about your teaching environment and how you might design a PTE. How would this PTE fit into a digital learning space? Add your comments below. Click here to go to next page. Couros, A. (2010). Developing Personal Learning Networks for Open and Social Learning.